In 1974, Quaker Valley Ambulance Authority was organized as the second municipal ambulance authority in the United States, providing EMS and medical transportation services to Aleppo Township, Bell Acres Borough, Edgeworth Borough, Glenfield Borough, Leet Township, Leetsdale Borough, Haysville Borough, Glen Osborne Borough, Sewickley Borough, Sewickley Heights and Sewickley Hills. The Board of Directors is comprised of one appointed representative from each municipality, providing each community with an equal vote - regardless of its population or size. In 1974, Quaker Valley Ambulance Authority entered into a joint operating agreement with Valley Ambulance Authority to share facilities, personnel, administrative costs and operational expenses. The Authority is co-headquartered with Valley Ambulance Authority in a facility located at 3550 University Boulevard in Moon Township, between the Sewickley Bridge and Coraopolis. The mission of both authorities is to provide exceptional emergency care and medical transportation services to the residents and visitors of their communities. QVAA owns and operates two (2) Mobile Intensive Care Ambulances and one (1) wheelchair van - all of which are part of the combined fleet with VAA. 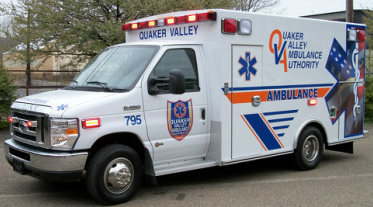 Quaker Valley Ambulance Authority is a non-profit municipal authority supported by insurance payments and donations. QVAA also receives proceeds from an annual per-capita tax assessment which is currently established at $8.00 per resident. the closest appropriate medical facility. Quaker Valley Ambulance Authority is a IRS designated 501 (c) 3 charitable organization.